The most ridiculous 'daily' missions. for FOUR poxy tokens!! This replaced 'get 14000 personal points for capturing bases, score is reset if you die' (wording may be slightly different in game). Both absolutely ridiculous chores to gain four tokens. I accept there needs to be some difficulty in obtaining these tokens but seriously the one that i posted the screenshot for could take weeks for the average player to complete. Certainly "daily" is a misnomer. Most of these missions would take several days for a casual player and some of the ones with more ridiculous conditions, which the one above is tending towards, could take a very long time indeed. In my opinion the missions need to be revamped, first to remove some of the element of luck - will I ever see a command centre at tier 4? - and secondly to remove the need for experienced players to go seal clubbing at tier 4 or below. Yes, there are stupid missions, but I have not met missions that require months to finish. Daily missions really need a rework, if not just to the descriptions. For a lot of them, you get the requirement of 'required number' but it often does not always tell you what this is, so you have no idea what you need to do to meet the requirement. The 'daily' is also a bad description, as noted, these take longer than a day (weeks - months for the 10 token missions if you don't have the correct aircraft and need to tier up to get them), there is often also the requirement of winning, which in the current game format is almost always out of your hands; you have do amazingly well, and be the best player in the battle, but still lose due to having useless bots. (today I have had bots TK'ing and ramming each other, and you wonder why the battle is a loss!!!). What i do like about the missions is they require you to play at all levels, unlike WoT which missions are often tier IV and above,and WoWS where there is little point in playing below Tier V. Also often require you to use specific nations / types, which may be out of your comfort zone, but it's good for encouraging you to play our of your comfort zone, and try different aircraft/nations. 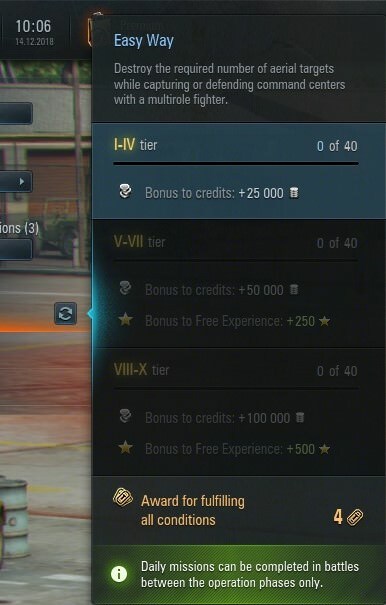 At the same time, maybe there should be a lower reward (say half the tokens) if you don't have any of the required aircraft at tier 8 or above, as this will hold back new players without anything in the higher tiers from being able to complete the missions. Followed closely by the one where you must not kill the planes but weaken them for your "team mates". The condition that actively promotes you fly like an idiot and not achieve anything. It is ridiculous that, in order to find this information, you have to scour the internet for a document containing it. True, except that ideally experienced high tier players should not be encouraged to fly at tier 4 and ruin the experience of new players. That's a good idea. There should be tokens for each level of the mission, not for completing all the levels. Edited by RoyalFlyingCorps, 16 December 2018 - 05:23 PM. Edited by xr901, 16 December 2018 - 05:58 PM. The statistics I have gathered show that tier 4s are in the lower tier around 60% to 65% of the time. I feel dirty every time i have to go back to tier 4 and massacre newbies in my bf110. But tokens are tokens, if WG doesn't care, nor do I.
I got a beauty today. Become one of the top 3 in damage done to aerial targets in 10 battles. Results count only if you survive the entire battle. I don't have any stats on how many battles I don't ever die in but it's certainly a lot lot less than than the number I win, so if this is to replace the condition that only wins count, it's a fail. Just guess work here but I think/feel I don't die about 1 battle in 10, that means 300 battles before I even factor in being in the top 3. This one will be getting the elbow tomorrow lol. Today i replaced a mission with assists in a single game. And it was replaced with a completed mission from yesterday. Can this game get any more retarded than this? In 1.X's, I used to be a very acive player, and spent many hours a day here. Nowadays I play WoWS. Practically since the release of 2.0, but I have kept on playing after the new version for a short while. To be honest, I'm one of the few players who was mainly active in pre-2.0, but actually ENJOYED 2.0+. And would have kept on playing (and would actually still log in daily!) if it weren't for these braindead daily missions designed by a braindead idiot. It used to be fun. Logging in, spending 1 or 2 hours at most for the daily missions, and getting your 3-9 tokens for it. Even though I only play WoWS, I would still log in... and PAY for a unified WG Premium account... if the missions were similar to the old days. There can be new ones, I don't mind. But the time required should still be casual. Now there was a 50% discount on a 1-year-WoWS-Only-Premium account for -50% cost. If the daily missions here would create any incentive at ALL to log in and play 1-2 hours here, I swear by the gods that I wouldn't have purchased that premium, and would remain a loyal "unified-wg-premium-acc" buyer. I have no idea which way the sloppy developers will push (or leave) missions, but as long as things remain even remotely similar to how they are now in terms of the dailies...the WoWS team has my wallet...and not the WoWP one. Can this game get any more retarded than this? Above exaggerated for comedic purposes - I realize the actual number is usually 20 - 50 but with the loss of control causing me to lose battles again and again it certainly feels like 600! The problem here is the "lost control Joystick bug" and not the daily missions. When I see how I play for missions without win requirement I have to say they all should have also the win requirement. Otherwise I mess up my battles just for the mission and I'm not the only one doing this. - I think all token missions should have a win requirement. - Missions that force idiotic gameplay like the assist missions have to be removed.